drums should be avoided the 55 gallon drum can be obtained by anyone almost anywhere. Attractive in a DIY novel innovative kind of way, variations on the theme are starting to creep into the domestic market. Cast iron fittings such as the door and flu attachment can be purchased to embellish your stove and a second barrel added to increase heat exchange. 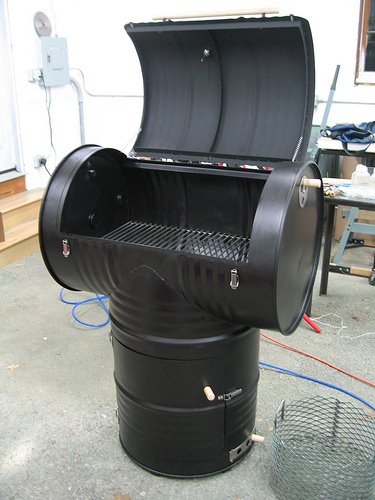 There are many variations on these designs, the barrel can be upright and free-standing, attached to another barrel on its side or on top of each other, and these are all available in kits minus the 55 gallon drum. To build your own the only tools needed are a drill, a reciprocal saw, tape measure, L-braces, black stove paint, simple hand tools and best of all only a basic level of skill. You will need a sturdy 55-gallon steel barrel with both ends attached. With a hammer and screwdriver, cut out the end of the barrel that has the plug-in it. This will be the floor of the fire-box. The bottom end will be the cooking surface. After the end is removed, clean the inside of any chemical or other residue. The stov e-pipe opening should be on the cooking surface end of the barrel, near the back and close to the seam. Set a section of stovepipe on the top of the barrel about an inch from where the seam runs down the back. Using the inside of the pipe as a guide trace a circle on the top of the barrel. Remove the pipe. Trace another circle inside the stove-pipe circle. The radius of the small circle should be about 3/4 inch less than that of the large circle. Drill a pilot hole in the small circle. Using a reciprocal saw, cut out the small circle and discard it. Next, mark and saw 1/2-inch wide tabs up to the large circle. With pliers bend these tabs up. The stovepipe will fit down over these tabs. Later you will bolt the pipe to the stove top with two “L” braces. Cut two rectangular openings in the front of the barrel, opposite the seam. There should be two crimped rings running around the barrel, dividing it in thirds. The smaller rectangle (12″ x 8″) should be cut in the upper section. This will be the opening to the fire-box. The larger rectangle (14″ x 10″) should be cut in the lower section. Leave the bottom ring intact, it gives strength and stability to the barrel. This larger rectangle will be the door. Save the small rectangle piece for making the draft. Do not flatten the rectangles because the curves fit well. Use a pre-loved house door-hinge, the wear will allow for thermal expansion and contraction. Center the door over the opening, drill holes and hold the hinge to the barrel and the door. A single hinge should be sufficient enough to hold the door in place. The door latch is made from two 3″ x 3″ “L” braces. One bolted to the barrel and the other to the door. remove the end off one brace so it is a 3″ x 1″ brace. Then cut or file a notch about 1/4″ deep into the top of the one-inch end about 1/2″ from the bend. This notch will accept the brace bolted to the door and hold the door closed. Bend over the end of the other brace to make a handle. Bolt both braces into place, ensuring the one on the door extends past the edge of the door enough to engage the notch in the one bolt in that brace. It might take some adjustment, but the latch can be made to hold the door snugly in place. Building codes and homeowners’ insurance rules have changed, and federal laws governing wood stoves have been adopted. 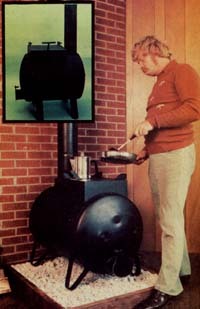 These stove designs may not comply with various federal and local regulations. It is advisable to check with appropriate officials before installing these stove in the home. often not airtight it definitely affects the quality of the burn. They are also hard to regulate as far as temperature goes. An improvement on the design can be in using a discarded electric water heater tank. The walls are 3-4 times as thick as a 55 gallon drum making the fire-box easier to make airtight and if constructed properly be easy to load, and will have excellent fire and temperature control. Lay the water tank on its side and add legs and the loading hopper box with a hinged lid then weld in an exhaust stack or smoke boot. Make sure all the parts fit snugly and the whole thing is airtight. The most crucial part of all is the draft control. If constructed well and doesn’t leak you have good and positive control of the stove’s blaze and temperature at all times. When finished paint all its outside surfaces with Rustoleum Bar-B-Q black paint or high temperature engine paint. The uses for these home-made stove ovens are as varied as their design. Commercially available units come in all shapes & sizes however it is important to note that the life expectancy of a new barrel is around four years depending on how often it is used. Older rusted barrels are not recommended, nor are barrels that have been used to store chemicals as these could prove to produce toxic fumes when heated. it is recommended that the barrel be painted with a good quality stove paint to improve its radiating capacity and its longevity. The three doors is a great idea! I’m drawing a plan in my mind for a fairly extreme shop stove with fan forced draft, a flat cooktop surface and now I’m thinking of a baking chamber. I’ve been scouring the internet grabbing bits and pieces to help me get the exact picture set in my mind. Thanks for the help. 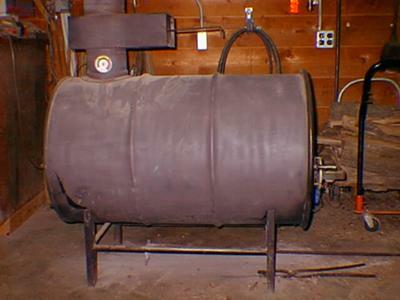 Using an oil drum is NOT a long term option; it’s cheap, but it cant last. Twenty two years ago I built a stove out of a diam. 300mm steel pipe, 500m long mounted horizontally with a smoke box on top with a baffle system, open for staring (turbo mode) and closed = cruise mode. This old stove is all but burnt out now, so I’m now going to build a new one incorporating all those improvements I’ve been wanting to implement – I’ve been looking for a better way to hinge the door so as to maintain an air tight seal. The original design of this stove came from Lloyd Seaman living as a homesteader in Nevada. He built stoves & sold wood. if you can’t afford to replace or repair your unit after 22 years, maybe you should go solar! How much can sell for? I have a 55 gallon drum with a Magic Heat re-claimer that I built 25+ years ago and it works as good as the day I built it. Those who say they won’t last just aren’t protecting the drum by keeping a stack of “old” ashes in the bottom for heat dispassion I would imagine. The unit is indoors in my barn and I have probably 50-75 fires a year in it with no issues. Thanx for that invaluable feedback. Maintenance is definitely an issue that would prolong the life of the barrel, well worth investigating. The best results that can only come through trial and error. Where did you find an 8 inch flue collar for a 250 gal oil tank?